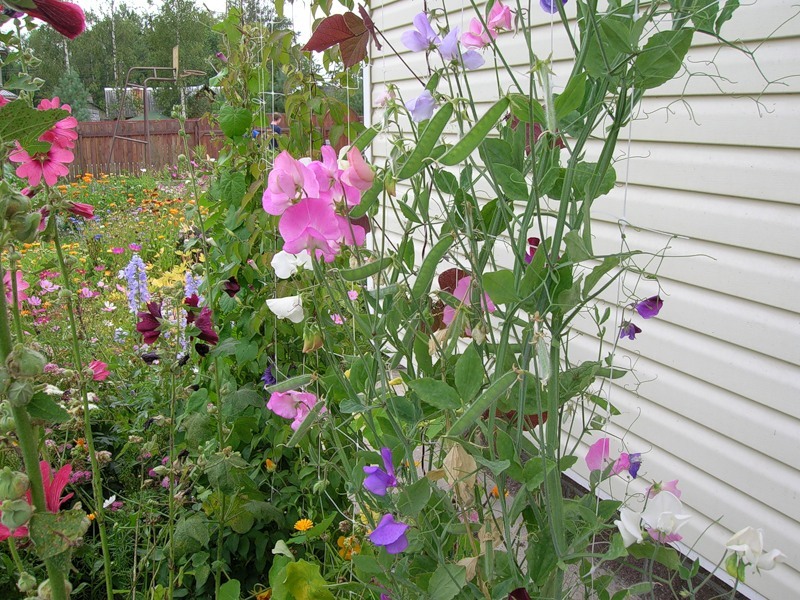 Vines for the garden, cobia, sweet peas, hops, morning glory, types, photo and video. It does not matter, how big is the garden, any area can be turned into a cosy green area, a place to relax amidst the beautiful flowers. 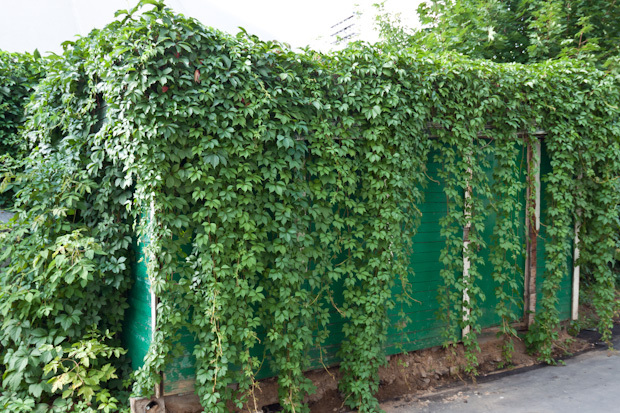 A special place in landscape design is a creeper, they like no other plants are able to create intimate space, to hide unsightly buildings, fences. 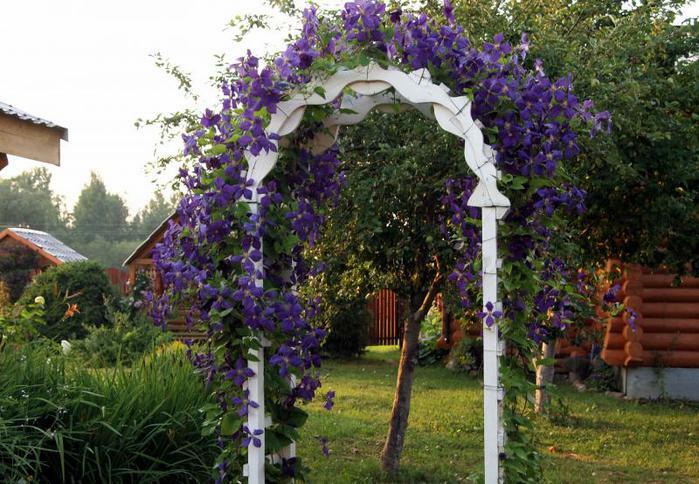 Gazebo or pergola, braided greenery, will look attractive and protect from direct sunlight. A fence with natural décor fits perfectly into the landscape and is admired by neighbours and passers-by. Basically, the vines grow in hot countries, where eternal summer. But for mid-latitude to select appropriate species and varieties is easy, and the advice of experienced gardeners will help you to decorate even a short warm period summer for more colours and scents. 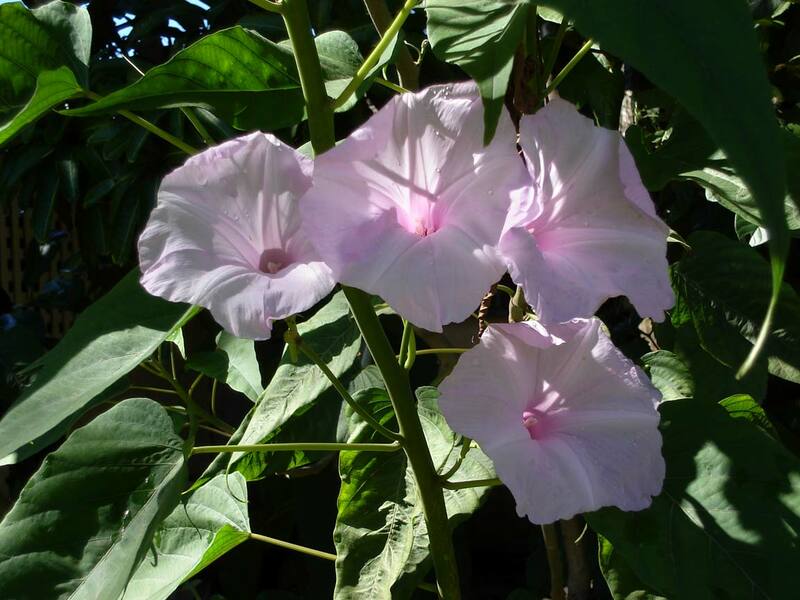 The efforts of breeders, has withdrawn a large number of varieties of this plant: large-flowered and small-flowered. Various shades, from deep purple to red and white, turn the garden into a real fairy tale: the beauty now is not only under my feet, but and braid construction. Clematis on the arch in the garden. Clematis whimsical, behind it need special care. Woody stems for the winter die off, you can save them under a warm shelter. 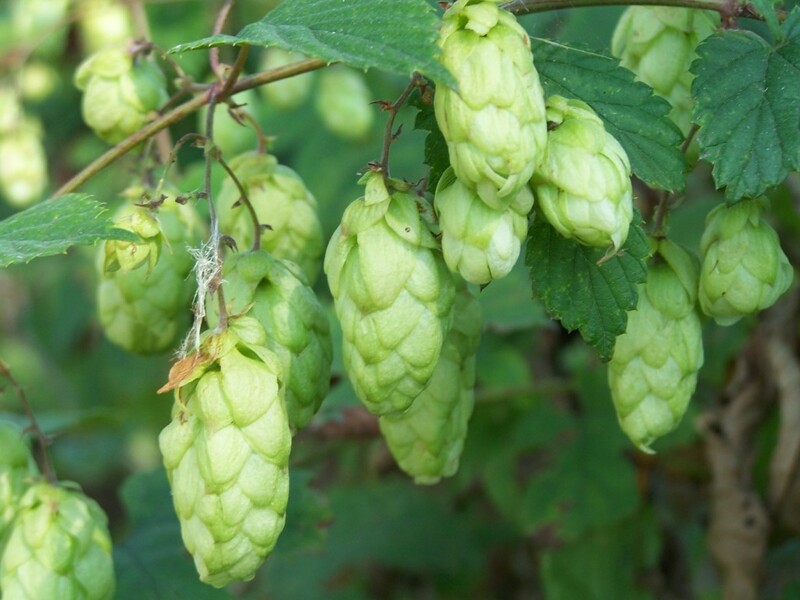 Prefers fertile soil with low acidity. Plants are planted in the pit depth of 70 cm 60 cm in diameter. Necessary drainage from rubble, pebbles, river sand. The treatment is regular loosening, watering. First feeding is carried out in the spring, the second flowering period, third – in the autumn, after flowering. 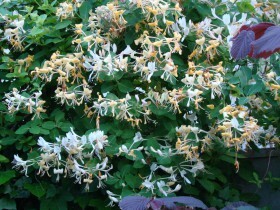 Popular in our gardens vine, unlike the clematis, unpretentious. Blossoms raised to the sun, have a wonderful aroma. Bark – grayish-brown, the leaves are dark green above, bottom – bluish-green. The flowers can be cream and white, pale pink. 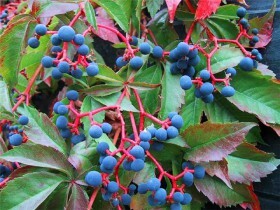 Ripe orange-red berries, oblong-spherical shape. Liana loves the bright areas, moist soil, hardy. Practically not affected by diseases and pests. Requires support, responds well to feeding. 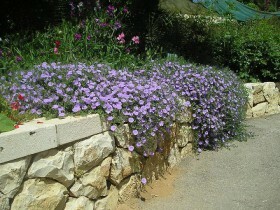 Used for landscaping balconies, the walls of the buildings, Windows, gazebos, terraces, espalier, pergolas. 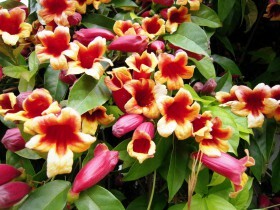 Beautiful, flowering vine with red jingle bells the most famous, although the selection offers other varieties with yellow, pink, lilac flowers. Campsis thermophilic, may not survive the cold winter, in need of shelter. 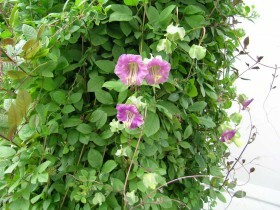 A very useful advantage – the vine not terrible fumes, it can grow even in the city. Plant a tree, it has a trunk and lush blooming crown. Requires Sunny areas in the garden. To admire these flowers all the time, they are pleasing to the eye for a long time, bloom profusely, drought doesn't scare them. 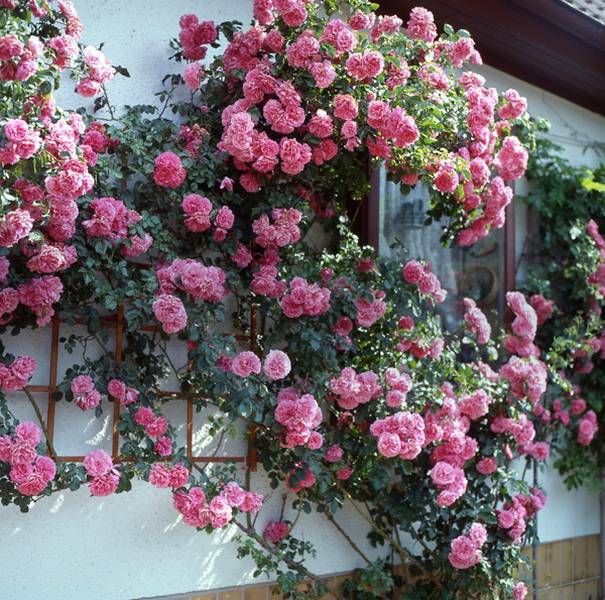 Support for climbing roses can be a bench and the wall of the house, the fence and pergola. It is impossible to plant a plant under trees and low, marshy areas. 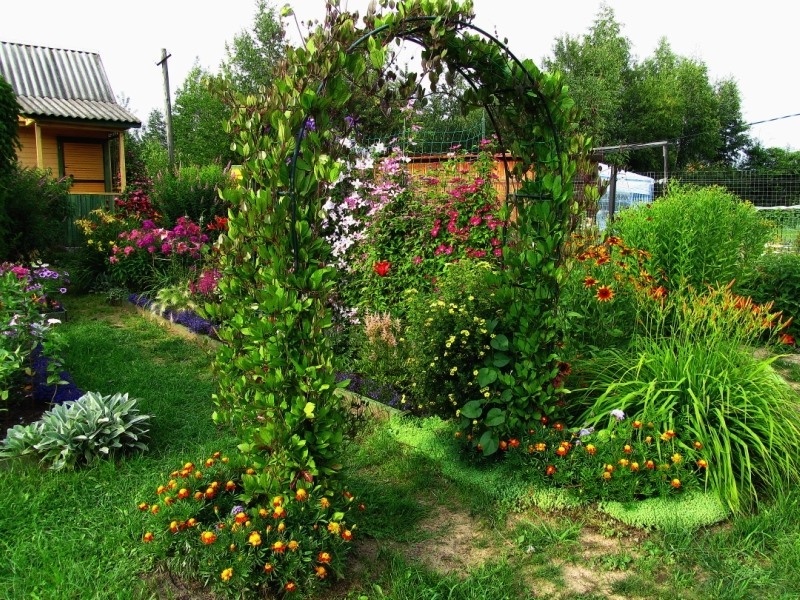 Care is simple – planted the bushes and watered two to three times per season feed fertilizers. Climbing rose on the wall. The plant is ready to stay in the shade, unpretentious, will be satisfied with the area of the site, he took. 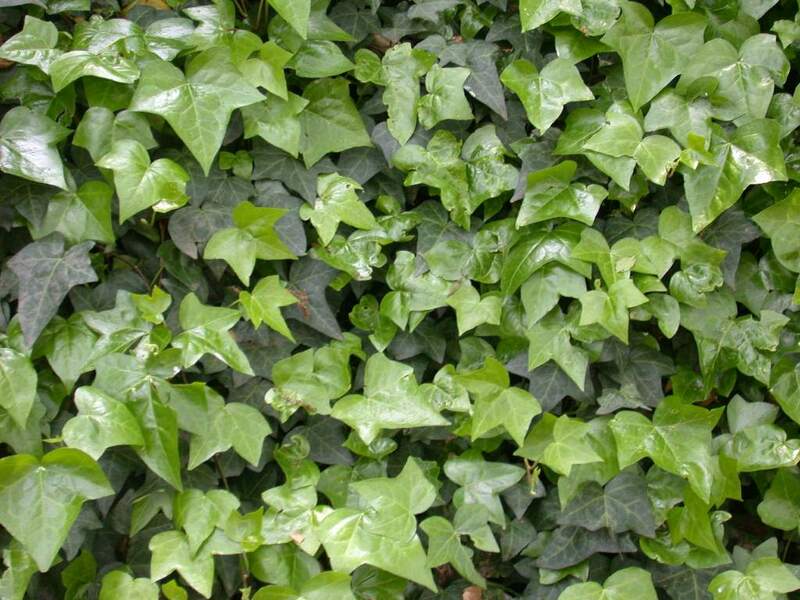 Ivy loves moisture, lush greens are able to gain a foothold anywhere, they are clinging to the slightest roughness. 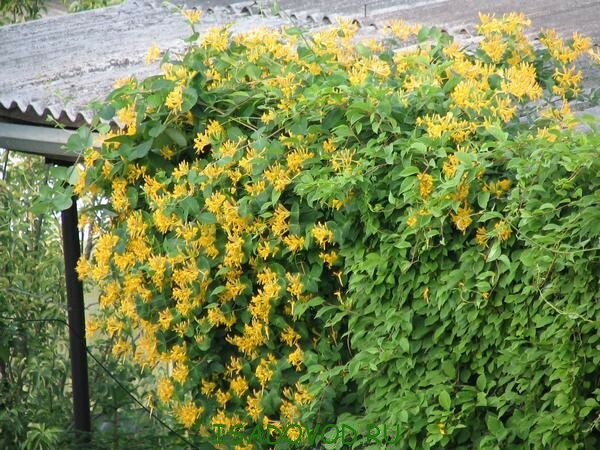 This kind of creeper known to almost all, it is hardy and able to grow anywhere, we offer a green thumb. The gazebo will be turned into a shaded secluded place, the plant is beautifully entwine balcony, the fence, the wall of the house. Foliage turns red in autumn. "Bumps" of perennial and tender greens create a good backdrop for any flowering plants. Nice ornamental plant for the decoration of balcony, terrace, hedge. 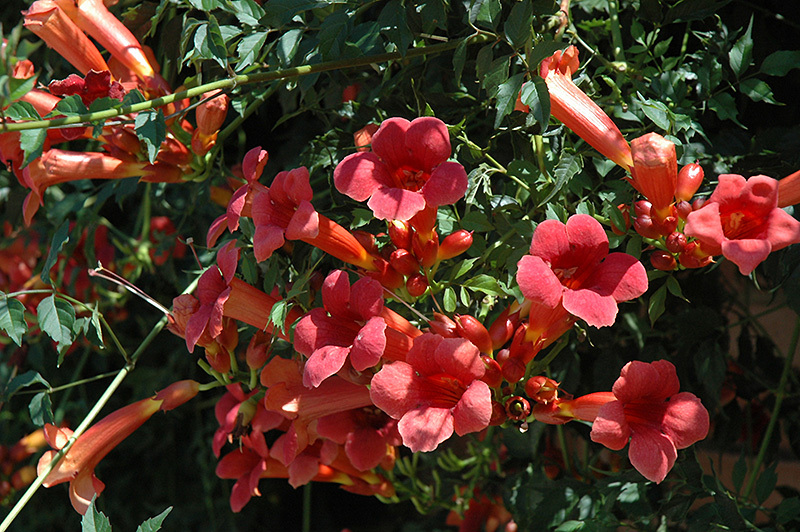 All kinds of bright, "calico" colors are pleasing to the eye, the flowers exude a pleasant fragrance. Peas come from the island of Sicily, where it still grows in the wild. There are about 10 000 varieties of plants, they are United in 15 garden groups, which vary in height, the length of the stalks, the number of flowers per inflorescence. 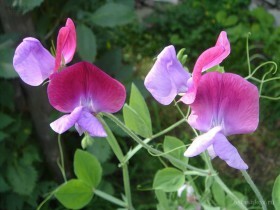 Peas resistant to frost, light, blooms profusely at moderate temperatures. Sweet peas at the wall. 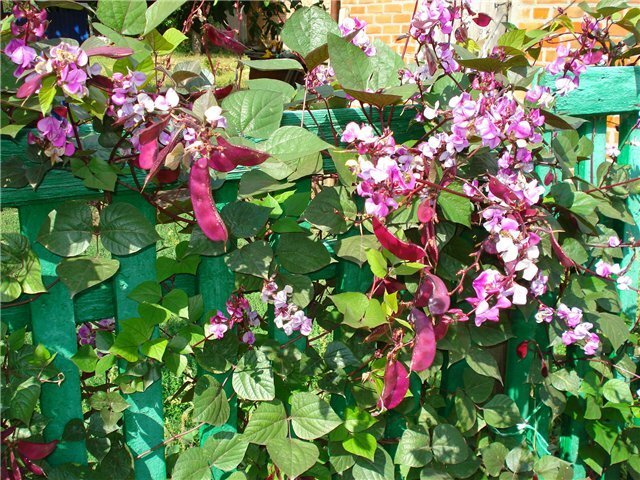 Bright purple flowers of this plant are known to many, there are varieties with blue, raspberry, pink flowers. Growing mini-Liana quickly, blooms profusely. 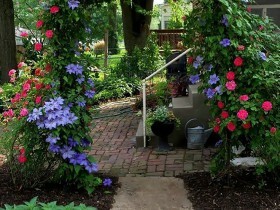 Morning glories adorn the terrace and the fence, the arbor and fence. Does not require special care, adequate regular watering. The plant reproduces by seeds, they are planted in the soil in early April, and after three or four weeks in the open ground. After a month the seedlings will need support. 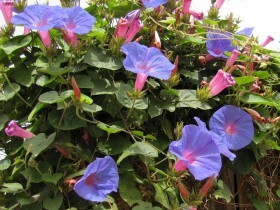 Morning glory-loving, resistant to various kinds of diseases. Fertilizing complex fertilizers are produced every three weeks. The plant is content in shadow areas, forms a kind of "curtain", which will hide from prying eyes gazebo or pergola. The small flowers are most often red or red and white, dichroic. 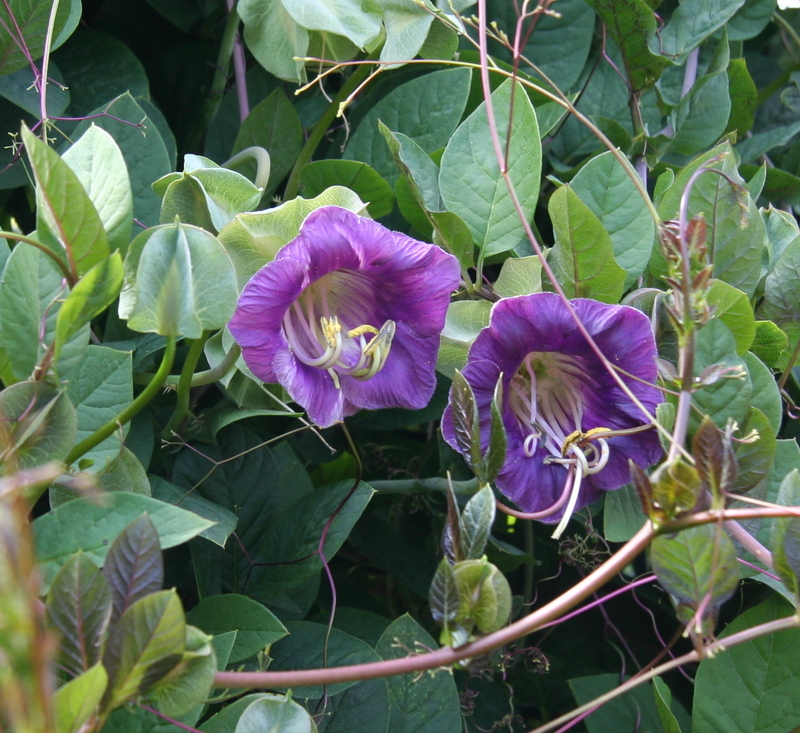 Annual vine native from the distant and warm Mexico. 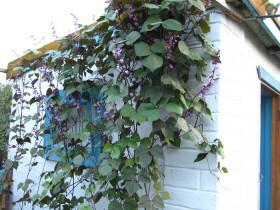 Large, graceful bells at the beginning of flowering green, then become purple, white or blue. The plant is whimsical, require special care. Decorative beans on the wall. Morning glory in the Park. Wild grapes in the fall. Clematis in the garden landscape. All content on this site SamDizajner.ru written specifically for Simdesigner, copying 1 in 1 strictly prohibited. Reprint, full or partial rewriting of the article “Vines for mid-latitudes”, possible, only when you specify the full, active link to the source.